Beginning the home buying process without the proper information can cause delays and unnecessary stress. The good news is that you don’t have to walk this road alone. Check out these six steps to buying a home before you begin searching the listings for your dream home. Due to the Fair Credit Reporting Act, you can order a copy of your credit report from the three primary reporting agencies each year. Inspect your credit reports for delinquent accounts and errors. Report any errors right away to the reporting agencies. Begin paying off delinquent accounts to improve your credit score. The home mortgage loan lender uses this information to determine your eligibility for a loan. You want them to see the best picture possible of your stability and reliability. Don’t make any large purchases that require a monthly payment. These purchases impact your income to debt ratio and could delay the loan approval. Most people are unable to pay cash for a home purchase. It’s completely acceptable to get a home mortgage loan. However, you’ll still need to pay money out-of-pocket for the down payment, closing costs, and moving expenses. A good rule of thumb is to have 20-percent of the selling price for the down payment and up to eight percent for closing costs. You won’t need to shed tears for saving too much money for the home buying process, but if you get caught short, you’re sure to feel the pain. Your real estate agent works hard to make everything as stress-free as possible. Choose an agent that listens to your needs, is knowledgeable about the local area, and communicates at a high level. Find someone who is more interested in your positive experience than on their sales number. A real estate agent who is honest and straight-forward provides you with the best chance for a successful transaction. It’s fun to daydream about luxury homes that are full of amenities, but it can be disappointing to have your sights set on a house that is outside of your comfort zone when it comes to the budget. Applying for a home mortgage loan is a wonderful way to find out exactly how much you can afford to spend. Knowing your target price range saves time and frustration. 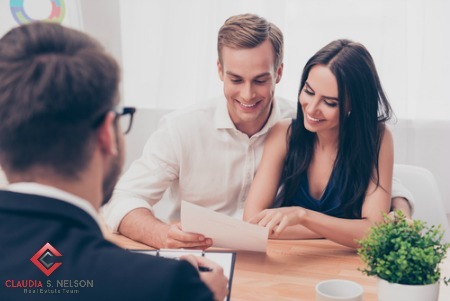 This pre-approval lets home sellers know you are serious about buying a home and can follow through with the transaction should they accept your offer. Putting in the right offer is one of the keys to home buying success. You want to impress the owner with your offer without overpaying. There may be other offers on the table, and you want yours to stand out above the rest. Listen to your real estate agent when it comes to setting an appealing offer. They have the experience you need on your side to catch the seller’s attention. The seller accepts your offer, and the home buying process proceeds to the next stage. The lender will schedule an appraisal and any needed inspections. Once the investigations are complete, and everything is in order, you will arrive at closing day. Celebrate this day! You sign any required paperwork, pay all fees, and collect the keys to your new home.